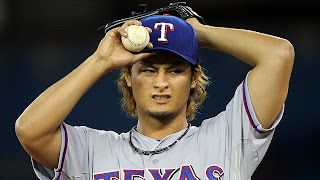 Mariners Latest: Yu Can't Handle The Mariners! Yu Can't Handle The Mariners! Today was a true test for the M's. Coming off of a long road trip in which they were annihilated by the Yankees, Redsox and Indians and saved face in Colorado by sweeping the Rockies in a 3 game series. They finished off the series going 4 and 6. Coming home to face the first place Texas Rangers and their highly potent offense was a challenge that many didn't believe that the Mariners would withstand. Felix Hernandez versus Yu Darvish. A match-up that you couldn't not pay attention to. Felix, a former Cy Young Award winner had struggled his last two outings and was looking to get things back on track against Texas who didn't allow Felix to beat them even one time last year. Darvish, 6 and 1 on the year, faced Seattle in his MLB debut and Seattle jumped out to an early lead and got rid of Darvish early. Texas managed to come back and win that game. There was a lot on the line for both pitchers in this one. Felix went through the top of the Rangers lineup in order in the first inning as the M's, Michael Saunders was issued a free pass from Darvish with two outs in the 1st. Ichiro Suzuki followed and stroked a drive down the right field line to score Saunders from first and race around to third base for a triple. M's had the early lead, 1 to 0. The M's had pressure on Darvish again in the 3rd inning as Brendan Ryan led off with a single and Dustin Ackley walked. Saunders tried to sacrifice the runners over and failed, hitting into a fielder's choice. Ichiro came up again and knocked a single into center field that scored Ackley from 2nd and Josh Hamilton came up trying to gun Saunders out at third and overthrew the ball into the Rangers dugout. That advanced Saunders to the plate and Ichiro to 3rd base. Two batters later, Jesus Montero would hit a sac fly to score Ichiro and make the score 4 to 0 M's. The 4th inning the M's added on one more run, but it really should have been a lot more. Darvish issued a walk to the first three batters he faced before watching Ackley come to the plate. Ackley hit a single to right field and everyone advanced. M's 5, Rangers 0. Then, with nobody out and the bases still full, the M's managed to strand the three runners by hitting into a fielder's choice twice and Kyle Seager finished off the inning by striking out looking. Although the M's have scored runs as of late, they still seem to choke when there are runners on 2nd or 3rd with less than two outs. Luckily they had a 5 run advantage already. Luckily Felix was pitching like the King today. Felix dominated the Rangers order through 7 innings before Mike Napoli took him deep to lead off the 8th inning. Felix finished 8 complete innings and handed the ball over to Tom Wilhelmsen in the ninth with a 6 - 1 lead. Wilhelmsen shut down the Rangers in order in the 9th and the Mariners won their 4th straight game. In what seemed to be a lost season a couple of games ago, looking at the standings today we find the M's in third place, still ahead of the Angles and just 6.5 games behind the Rangers. Not that I look to sweep the Rangers in the series, but if we did, we would only be 4.5 games back. Last year, just before the All-Star break we had a series with Texas that could have landed us in first place if we even won two of the games, instead we got pummeled and never came close as the M's dropped 16 straight games. Hopefully this season we will find our way to a steady incline rather than slipping away into the depths of last place. Tonight was a great night for the M's and for Felix. As for Yu Darvish, he hasn't figured out how to solve the M's just yet. Hopefully the Mariners can have similar results in the next two games as well. Let's go Mariners!! !